The aim of the project is a cross-linguistic comparison of valency behavior of Czech and English verbs. Not only theoretical comparative studies particularly focused on differences in Czech and English verbal valency structure, but also hands-on experience of work with corpus data are expected. The theoretical aspects include both a description of verbal valency in both languages and a description of interlinking of translational verbal equivalents with drawing a follow-up comparison between the achieved results. The project is based on the valency theory of the Functional Generative Description and on its application to a corpus, namely to the Prague Czech-English Dependency Treebank (PCEDT; http://hdl.handle.net/11858/00-097C-0000-0015-8DAF-4). This theoretical approach allows a proposed specification of relations of verbal valency frames in both languages, relating to semantic and morphosyntactic level. The work with data includes the creation of a parallel bilingual Czech-English valency lexicon called CzEngVallex. The CzEngVallex (http://lindat.mff.cuni.cz/services/CzEngVallex; to download: http://hdl.handle.net/11234/1-1512) connects 20835 aligned valency frame pairs (verb senses) which are translations of each other, aligning their arguments as well. 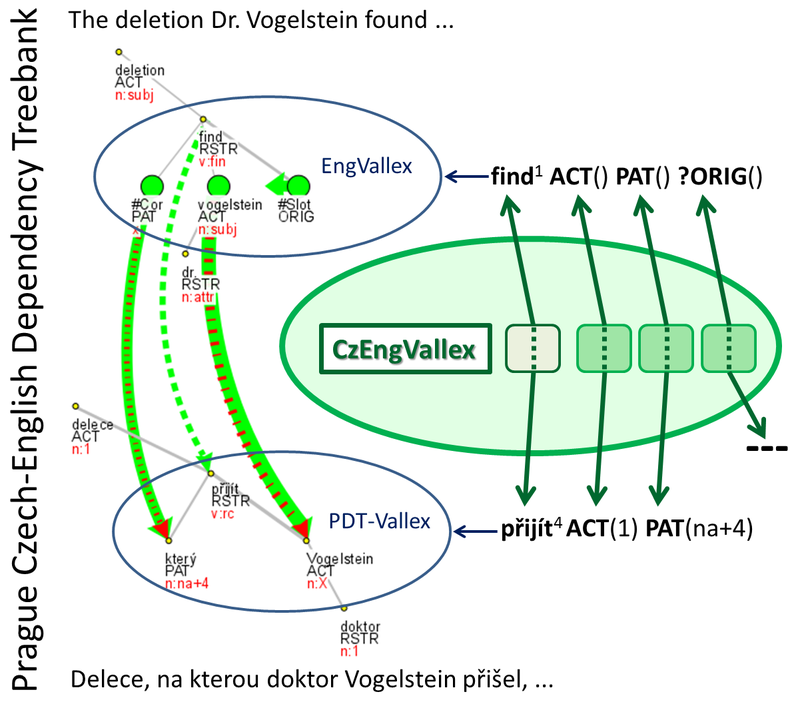 CzEngVallex' verb and argument pairings refer to two underlying valency lexicons used in PCEDT annotation, PDT-Vallex (http://lindat.mff.cuni.cz/services/PDT-Vallex) and EngVallex (http://lindat.mff.cuni.cz/services/EngVallex). The CzEngVallex serves as a powerful, real-text-based database of frame-to-frame and subsequently argument-to-argument pairs and can be used for example for machine translation applications. The search tool enables to search either the CzEngVallex lexicon, or the associated parallel Czech-English corpus, the Prague Czech-English Dependency Treebank (PCEDT 2.0), or both at the same time, allowing for complex search conditions to use for various linguistic problems. The search interface is divided into two parts: on the left, the query results (lexicon entries and the linked corpus sentences) appear after a query is executed. The query area is on the right, and it contains several fields to fill in or select to formulate the query (Fig. 2). The Czech or English direction of search can be chosen by clicking the toggle button near the direction specification, which shows the current direction (Searching/browsing lexicon in Cz→En direction). The search direction is only for convenience, since it only affects the layout (order) of the search fields below in the query area; the same results will be obtained by either direction by cross-filling in the query appropriately. 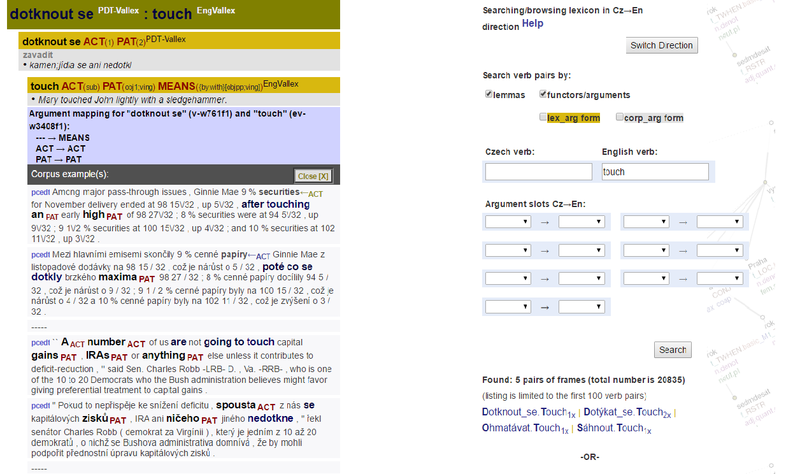 As the simplest possible way of displaying CzEngVallex entries and the associated corpus sentences in which the verbs appear, the lexicon can be browsed by using the alphabet list in the Select verb area (lower part of the right-hand side of the query area) of the search interface (below the query entry area proper). After clicking on a letter, a list of verb pairs associated with the verbs starting by the selected letter on the source side appears. A particular pair can be then selected, and it appears in the query results area on the left. The verb pairs can be searched by lemmas (checking the lemmas box) in both areas, in the lexicon and in the corpus, writing down the Czech or English lemma. One or both lemmas can be entered; if no lemma is filled in on either side, then some other part of the query has to be specified (see below). 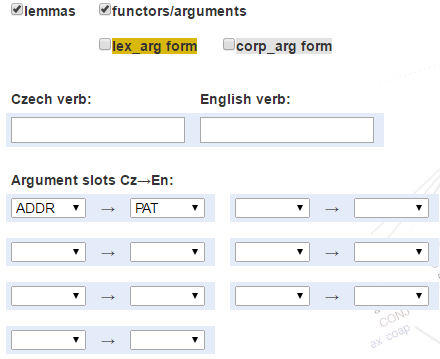 The search tool enables to search also according to the verb argument (functor) label by checking the functors/argument box. There are maximum seven arguments associated with any given verb; for simplicity, all of the seven possible functor search windows appear once the checkbox is on. The labels used are taken from the valency lexicons and corpus annotation (for a full specification, see the Functors chapter in the PDT Tectogrammatical manual). It is also possible to combine the search for a particular verb or verb pair with conditions on argument pairing. In addition to searching by lemma and functors (arguments), a specific form realization can also be specified to further limit the search results. 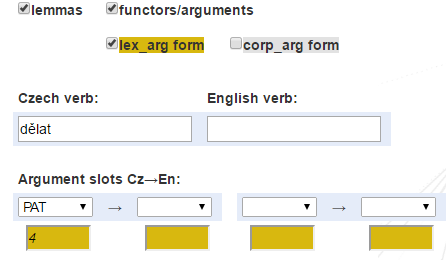 Then, for each possible argument, additional search window with yellow background appears that can be filled by the required form specification. For example, one can search for accusatives only as the surface realization of a particular argument, or for a prepositional case, subordinate clause etc., either together with filling in the functor and verb lemma, or independently in order to get, for example, all verb pairs where English PATient corresponds to Czech PATient expressed by the preposition “na” with locative case. for direct speech (in Czech): "=.s"